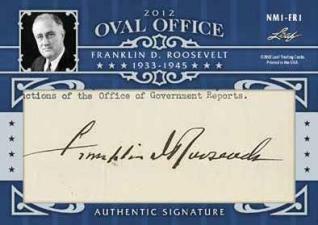 2012 Leaf Oval Office Cut Signature promises a Presidential autograph in every pack. Not for the faint of heart, the checklist includes cut signatures from every man elected to lead the country. 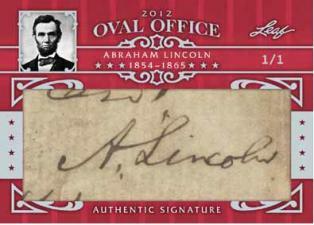 Collectors can also look for Dual Cut Signature Cards pairing up Presidents with historical figures. Every card comes encapsulated by BGS and is numbered to no more than five copies. The print run of the ultra high-end product is 275 single-card boxes. 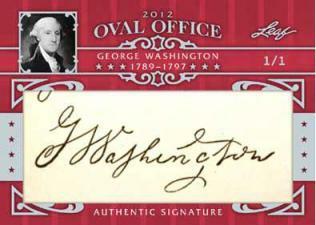 Cut signatures from every American President is included in the set. All cards numbered to 5 or less and encapsulated by BGS. 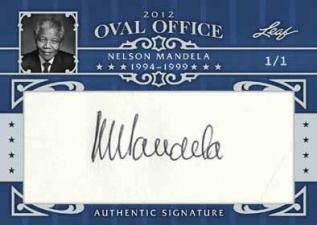 Dual Cut Signature Cards pair Presidents with historical figures, such as Barrack Obama and Nelson Mandela. George Washington and Abraham Lincoln are also featured together on a single card. Cards have pictures of the signer. Final print run will not be higher than 275 boxes, although it may be less based on initial orders.